After I sprayed all the baseboards we had some carpet guys install our new carpet we had previously ordered. It was a long day but the results were worth it. Old, stretched out, worn out, and threadbare. 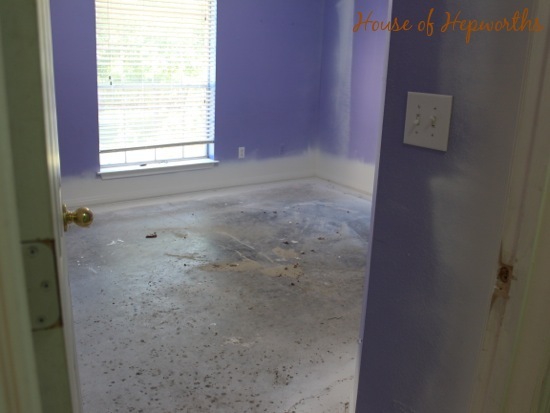 I can move into a house that needs lots of love and then DIY it to my liking while living there, but moving in on the old carpet was a deal-breaker for me. 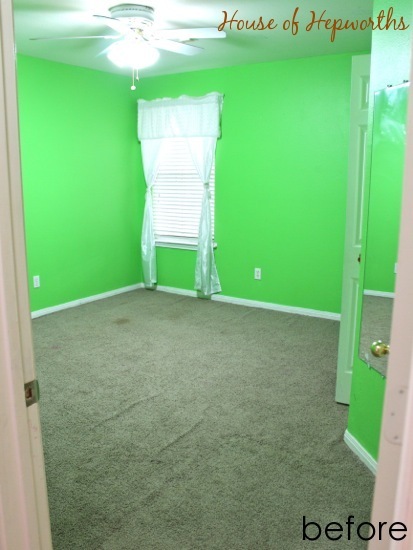 First off, I don’t want to move into a house with gross carpet. 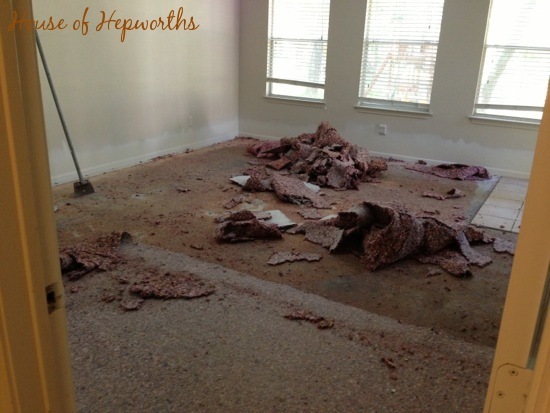 Secondly, it would have been ten times harder to replace the carpet once our stuff was moved in. The carpet company we went with told us to just peel back the edges of the carpet and fold it in on itself when we painted and that they would take care of removing the carpet for us for an additional $30. Um, sold. You don’t have to tell me twice! I’ll talk more about who we went with and why at the end of the post. The installation day finally came and the guys were here bright and early tearing out the old carpet. I didn’t take pictures of them doing it because I don’t know them and felt weird posting pictures of them online without their consent. I like to DIY when it makes sense, but installing my own carpet? No thanks. The rooms are already looking so much better with just the pad. Everything went pretty flawlessly until they got to the game room. Poor installers. At some point in this house’s history someone laid carpet tiles, then removed them, then carpeted. Well, the glue from the carpet tiles really loved the pad and created a bond comparable to liquid nails. The guys had to literally scrape the glue and pad off the floor using brute force. They were exhausted by the end of it (and yes, I did throw in a tip at the end. They earned it!). 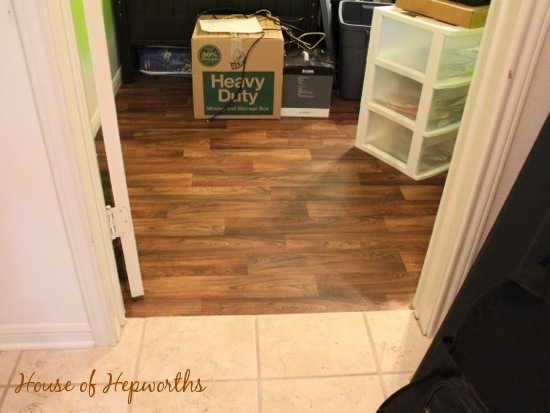 In addition to the carpet, we had vinyl flooring laid in my husband’s office (the spare 4th bedroom). He works exclusively from home, so having a comfortable work space for him was at the top of our priority list. He has hated using the plastic carpet mat made for office chairs on carpet and has wanted “anything but carpet” for the last 3 years. We went with vinyl for a few reasons. Mainly, we wanted something cheap that would last a few years until we redid all the other floors in the house. We’d love to take out all the tile in the living spaces and hallway and replace with hardwood. When that happens we will take it into Ben’s office as well. 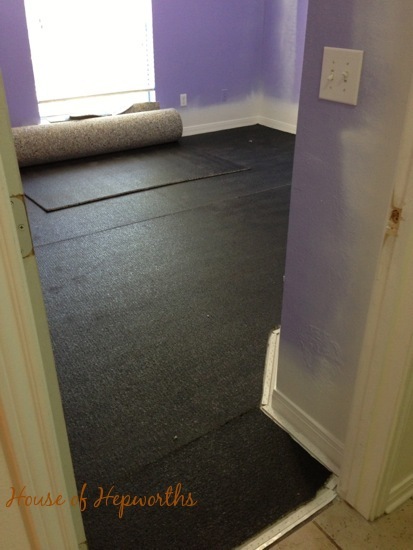 So basically we wanted a floor covering for the office that was cheap, temporary, and didn’t look horrible. The cheapest laminate we found was double the price of the vinyl, so vinyl it is! And honestly, I really like it and even entertained the idea of doing my whole house in it, but taking out all the tile and replacing it with vinyl for two years so I could then take out the vinyl to replace it with hardwood seemed like a dumb idea, so I scrapped that idea quicker than I thought of it. And now for some carpet pics! Yay! 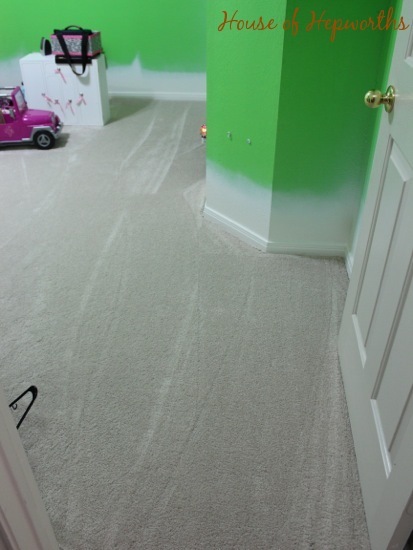 Even with the terrible paint job going on, the carpet makes the room look so much cleaner and fresher. In a perfect world I would have had months to paint the walls and prep the house before moving in, but I don’t live in a perfect world. I live in a world where I had 5 days to do as much DIYing as possible before the moving truck showed up (which we also DIY’d ourselves. yikes!). 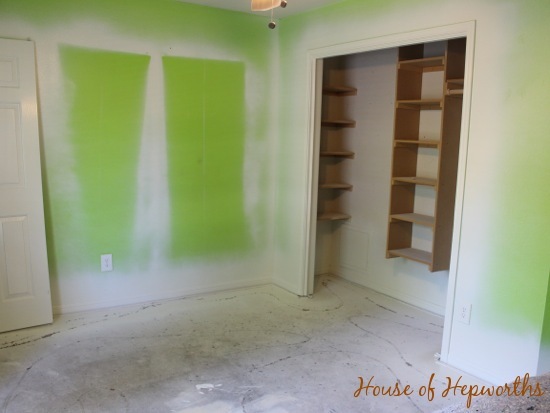 Unfortunately, we only had time to paint the baseboards and have the carpet installed. But seriously, painting the walls is next on my list. Here’s a sneak peek of our game room looking into the hall. I didn’t vacuum beforehand and there are no pretty carpet lines. Gasp! 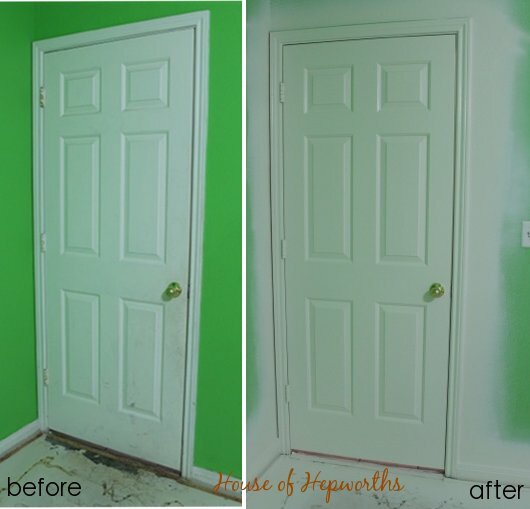 Remember that door before-and-after I showed you in my painting the baseboards post? Well, here’s another picture of the same door with the carpet installed. Pretty carpet. I want to pet it. 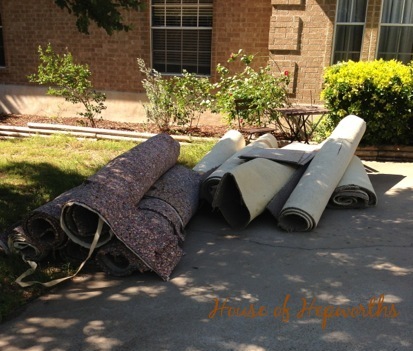 We looked into the big orange and big blue big box hardware stores as well as some other carpet companies in the area. America’s carpet outlet (ACO) had the best prices so we went with them. They also are a local family owned company, and I like to support the little guy when possible. ACO is a no-frills warehouse with rolls of carpet piled high to the ceiling. If you want a pretty show room with carefully hung sample squares, rows of tile samples, installed hardwoods on the floor, fancy music playing, and free cookies, you will pay a crap-load more for your carpet. 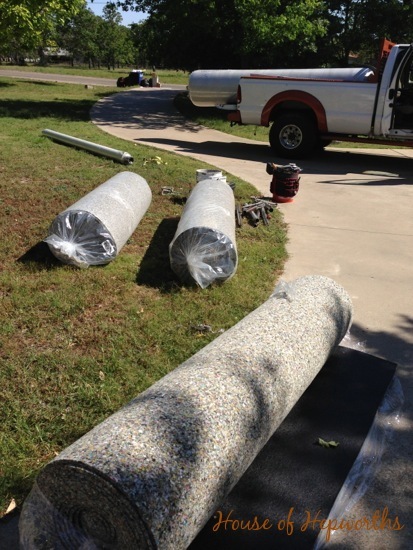 ACO has awesome prices on carpet and pads, and they subcontract the installation out to installing pros who you pay separately once the job is completed. 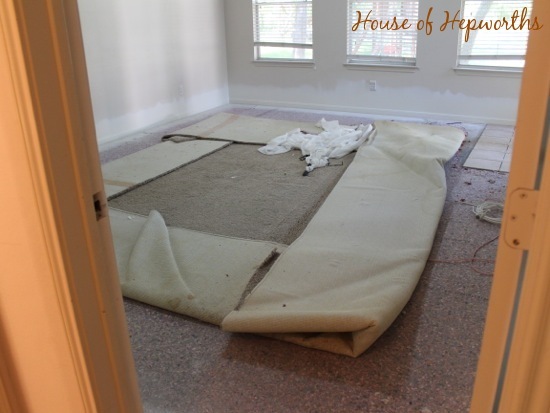 When we ordered the carpet we paid for the carpet and pad. We didn’t pay for the install until the job was completed and we were satisfied. The big orange and big blue hardware stores seem to have great prices on carpet and even offer a whole-house install for only $99, but what they don’t tell you is that you must purchase your pad from them which is upcharged just enough that when I factored paying a premium for their pad across more than 1200 sq ft of carpet space the total price was more expensive than ACO. Of course, you are getting their warranty and peace of mind by using a large reputable company, so I can see why people would be inclined to go with them. I, on the other hand, am super cheap so after researching ACO on the BBB and determining that even though the presentation of their warehouse and storefront leaves much to be desired I reasoned that I could get name-brand carpet at a fraction of the cost by sucking it up and purchasing from a showroom that wasn’t as pretty. 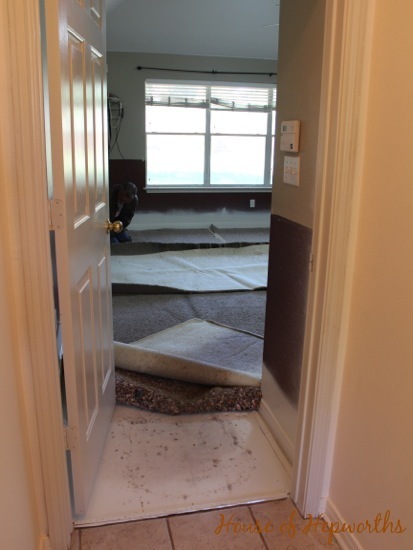 Oh, and compared to other carpet and flooring stores (other than our local hardware store), the prices were at least two THOUSAND dollars more for the carpet and install. I went into the store, choked on the price, and promptly left. So, in conclusion, we chose ACO because 1) it’s locally owned and operated, 2) it got a perfect rating (A+) on the Better Business Bureau, 3) they offered the same name-brand carpets as anywhere else, 4) they’ve been in business more than 17 years, and 5) it was the cheapest option we found. I’ve never bought new carpet before so this was a new learning experience for me. I have nothing to compare my experience to but I feel like the entire process was pleasant and I feel like we got a good deal (aka, I don’t have buyer’s remorse). I would love to come lay on your squishy new carpet! I can’t wait to see it with all the walls painted! We just put vinyl flooring in several of our rooms downstairs. At some point in the far away future we’d like to put down hardwood floors, but our house is older and as such, our floors slant at weird places, so it just wasn’t in the cards for us to fix those issues and put down hardwoods right now. I’m really satisfied with the vinyl flooring (along with a nice, cushy area rug). It looks and feels just like hardwoods! Plus, I love that it’s moisture-resistant, so we’re also going to put it into our kitchen this summer. You might look into vinyl plank flooring. Ours look like wood but it doesn’t scratch and is impervious to water. Make sure you don’t get it from a box store, though. Theres is way too thin. We went local in Waco and got commercial grade stuff. Three years later with small animals and children it still looks brand new. Wow–looks like the house is coming along great!!! 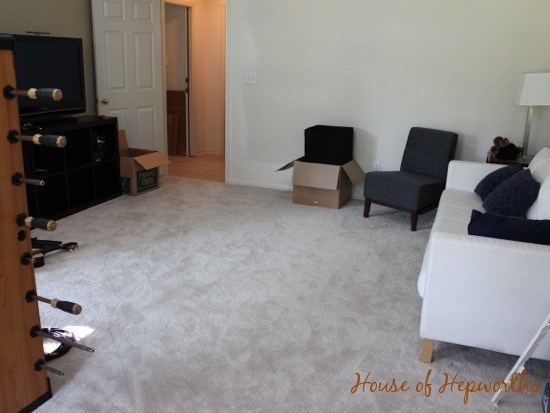 I too have never bought carpet before… we’ve just done hardwood floors. Great job on the progress! Love the new carpet! It looks so comfy and squishy! 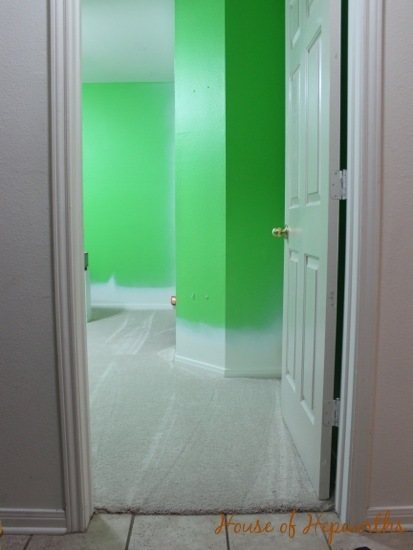 Looks great and I can not WAIT for you to paint that neon green room! It practically glows! LOL looking forward to seeing more! Personally I think you did what all first time new carpet buyers do. 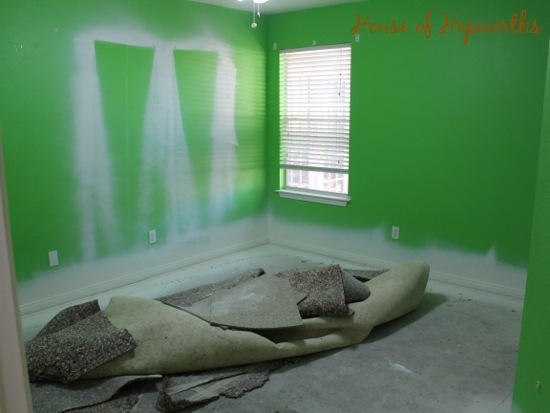 You bought light colored carpet to make the room look bright and cheery and open. We did that in one of our homes too, and it was a big mistake. No matter how big of a “clean freak” you are, or how innocent you think your kids and dogs and husband are, you will get a stain that will not come up. Darker carpet hids things like that a little better. I wish you the best and hope you are the 1% that doesn’t have a messy family! I’m sure it will eventually get dirty, but I have a carpet cleaner. Also, I am neurotic about not wearing shoes on the carpet and not eating food outside the kitchen. 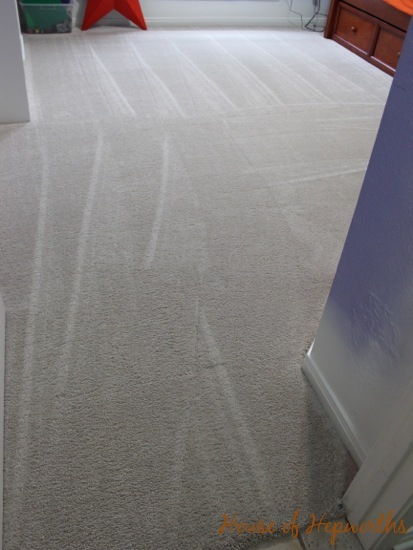 Our last house had very light carpet and after 3 years it still looked almost new. My kids know to keep the glue and glitter at the kitchen table. When we do hardwoods eventually we may take it throughout the entire house, so in that case the carpet will only be used for a few years anyway. 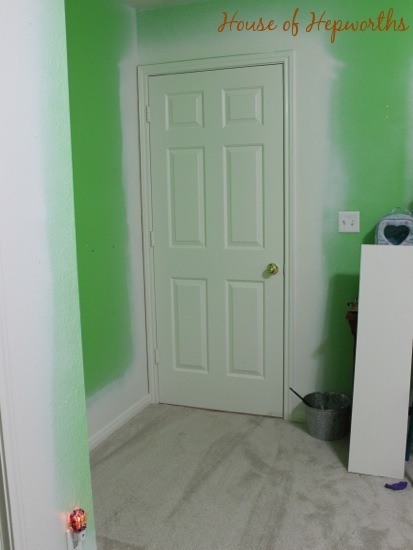 That is some serious GREEN on the walls! wow! I’m so blinded i can’t even see the carpet LOL I’m glad you are happy with the carpet. I hate carpet with a passion. Don’t have it anywhere in my house. 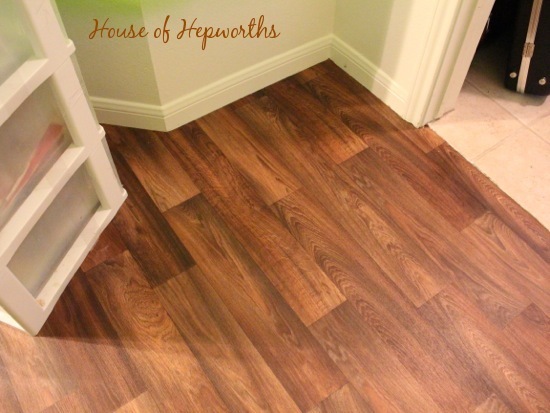 We put down this awesome no glue vinyl sheet flooring in a couple rooms where the hardwoods weren’t salvageable. It’s awesome and sticks down to the floor, no rolling. It was really affordable and is very durable. @micki I feel the same way about carpet. Really hate it mainly because I have seen what’s left after it’s pulled up, even after I have vacuumed it so often, just piles of dirt. Pure dirt. A friend got the planks of vinyl, a style that looks like scraped hardwood, sounds crazy but it seriously looks like a wood floor and is very durable, holding up well. Anyway, I have put down carpet, engineered hardwood, vinyl and supposedly the best laminate. Hardwood is the best hands down. I enjoy eating and drinking whatever wherever, I just can’t be that careful. Oh man, the green walls are killing me too! I need to paint them asap. I’ve been trying to get unpacked first. I actually like carpet, but really love wood floors, so we might down the road do all wood floors with some nice plush carpet-type rugs.